Colorkitten's Action Blog: yo gabba sleepover! 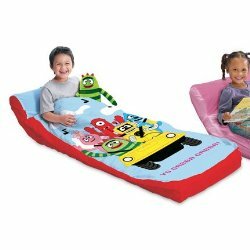 Reader Gal from Panada tipped me off to this one -- Sears Canada (not Sears US, apparently) has a Yo Gabba Gabba Ready-Bed, a kid's inflatable sleeping bag/bed thing -- which seems pretty cool, actually, the idea of a little built-in air mattress in your sleeping bag sounds good to me! I wish they'd had these when I was little, man did I hate sleeping bags on the floor. It is really interesting to see what is being released up here! We have the mini plushes (HB has little Brobee, and Muno) and we saw the singing characters, but only a Todee, Brobree, and Muno, and the train set! On the back of one of the display they show little balls that shake? That's what we wanted, but anyhow I think a trip over to Target will be in order soon. ps. Sleeping on the floor sucked, but I pity anyone who tried to get in between me and my "My Little Ponies" sleeping bag!